An authentic southern favorite recipe ... make your own roux, sauté celery, onions, bell pepper, and add spices, sausage, fish and shrimp. Make roux by browning flour in melted shortening; add celery, onions and bell pepper; cook slowly until onion is clear. Add other ingredients with exception of shrimp, file and parsley. Simmer for at least 1 hour. Add shrimp about 10 minutes before serving. Just before serving, add filé and parsley. Serve over hot cooked rice. Recipe Tip: Do you have a rice cooker? To prepare the rice for this dish … Add white rice and water to the inner pot of your Aroma® Rice Cooker. Press the Cook Switch or set to White Rice. 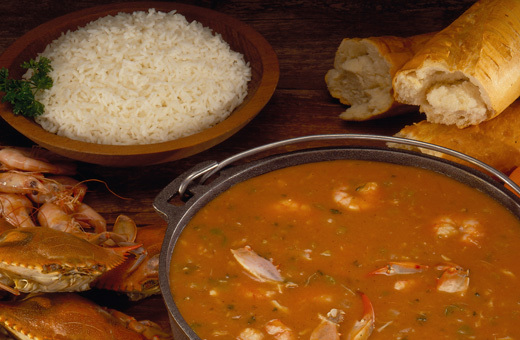 When the rice cooker beeps, it’ll keep your rice perfectly warm and ready to serve with this delicious gumbo.